This type of atmosphere in a picture really interests me. 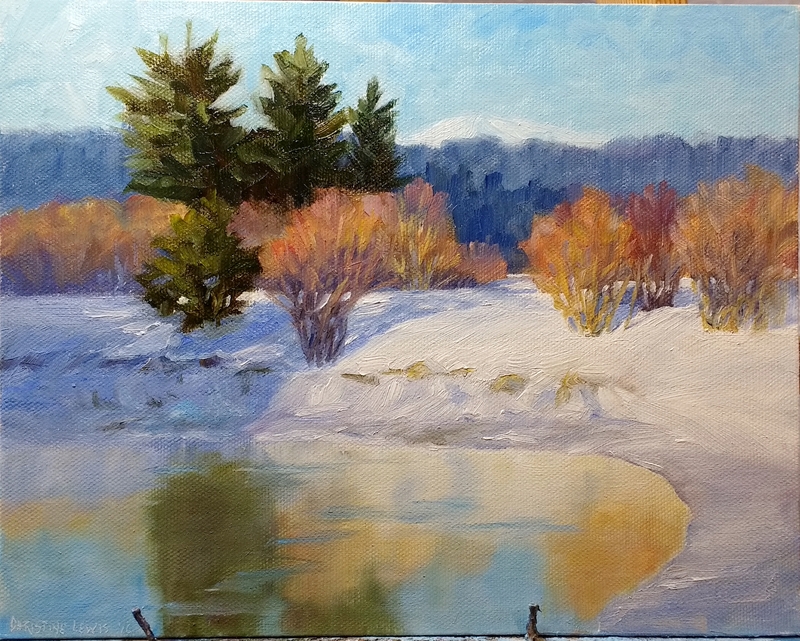 It is challenging because of the lack contrasting lights and darks, but I really find it interesting. I love to be outside on a snowy day like this or a really foggy day. There is just something about it that appeals to me. It seems like I have a lot of photos of fog or really atmospheric scenes. And they always call my name to be painted. 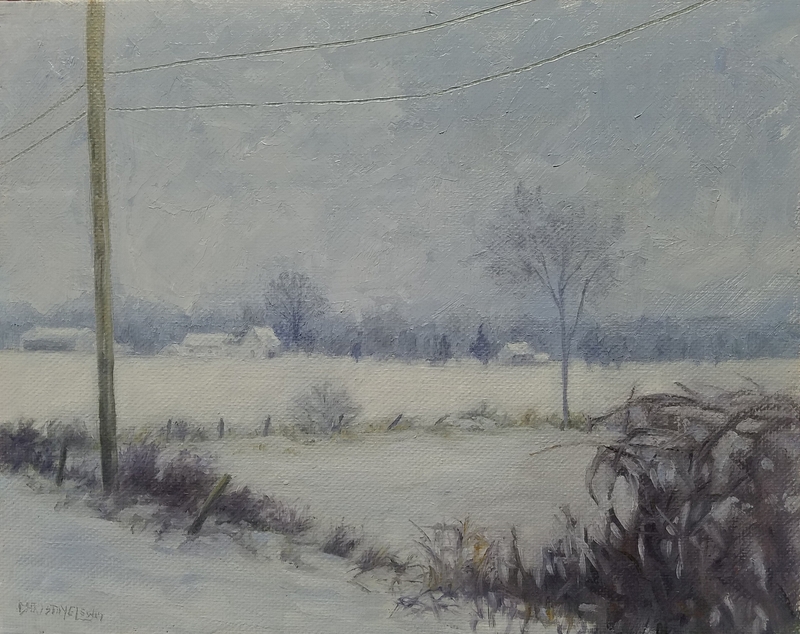 In this one I felt it was very helpful, interest wise, to have that bit of thicker paint to describe the snow in the foreground. It was something I added in later. 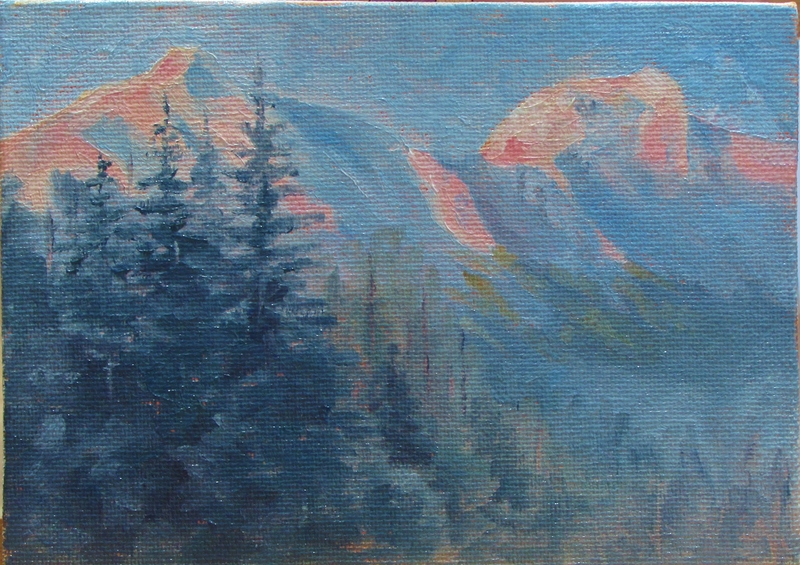 The intense pink on the white peaks here shows how red the evening light can be. Everything else around was almost black and white but the light reflecting on the mountain is red. 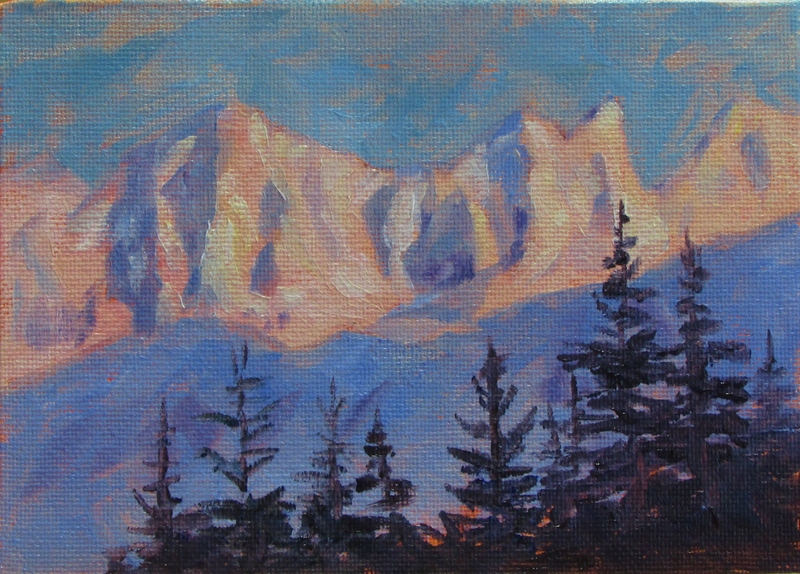 I see this often here in Juneau on the mountains, and I wanted to get it down on canvas so I remember the strength of the color. I love painted trees! I need to practice them close up because they are very tricky to paint. 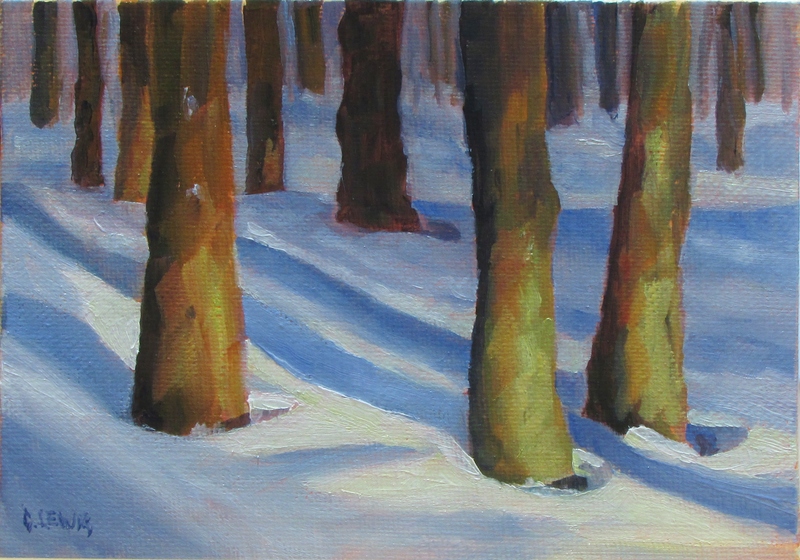 So in this I combined the tree practice with the strong warm light practice. 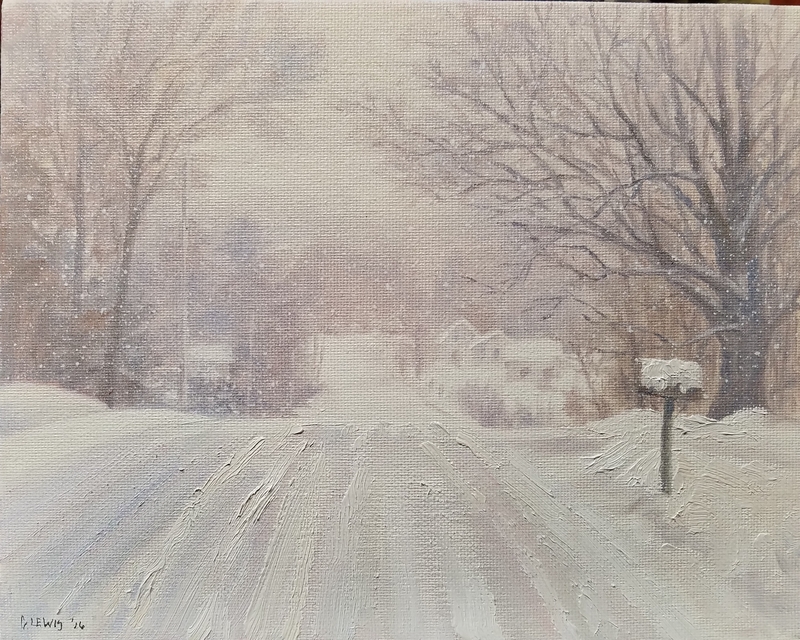 It is just a small 5×7, but I think it has good impact. When studying a subject close up, the things you learn can be easily applied to a more suggestive painting later on. This is another thing that I need to remember. 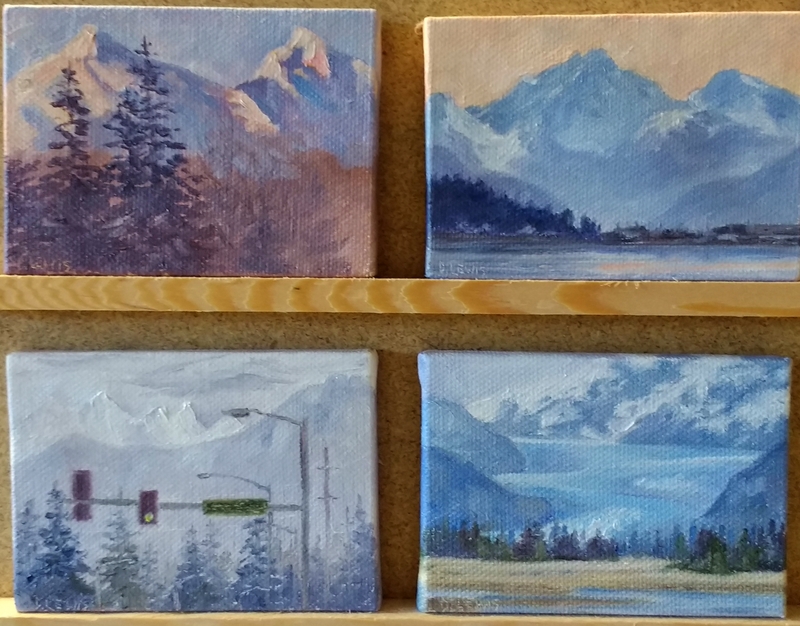 This is a little (5×7) study that I did to practice the color, temperature and value of the light.The sun hits the mountain peaks like this in the winter here in Juneau. (on one of the maybe 10 sunny days we get) It is so beautiful! I want to be able to capture the extreme impact that it has. I think this is quite close to how it looks. I’m am going to do several more this week. It will be my focus. 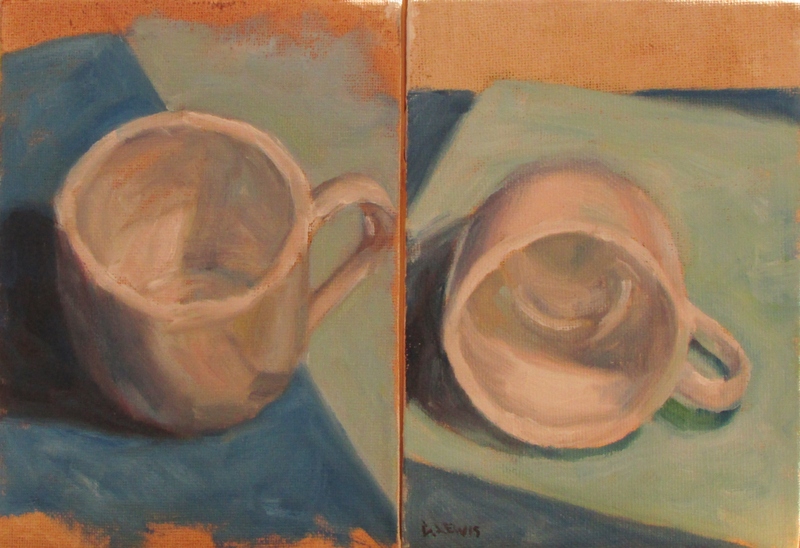 These are my first attempts at painting a white coffee cup. One of the exercises in The Daily Painting book, suggested doing 4 paintings that consisted of a cup and a couple different pieces of colored papers. These each took about an hour a piece and I tried not to be too fussy or to go back over them after my time was up. Overall I think there is progress. So I’m going to call it good!